Friday October 22nd 1926 I did my ironing. Dr Falchler called to see me and I paid him a small bill. I walked over to Harty McKinstrys. She had a regular party and a fine dinner. There was Mrs Clarke, McClay, Woolf, Hatton, Mount, Bailey, Culbertson, McKinstry, Taylor, [Armacost?]. Lizzie Duncan and myself at table. We saw The High School Parade pass. Later I went to look at The Sunderland home. Richard took me home. The girls except Edith went to The High School Circus. I did my packing in the evening. A delightful day. Saturday October 23rd 1926 I had Mr Albers take me to the station. I got a ticket that I could check my suit case home. While waiting in Bloomington wrote a letter to Emily Toon. Had a good train to Chicago from there. From Union Station went directly to Winnies in a taxi. Spent the evening at Fred Givens near by. 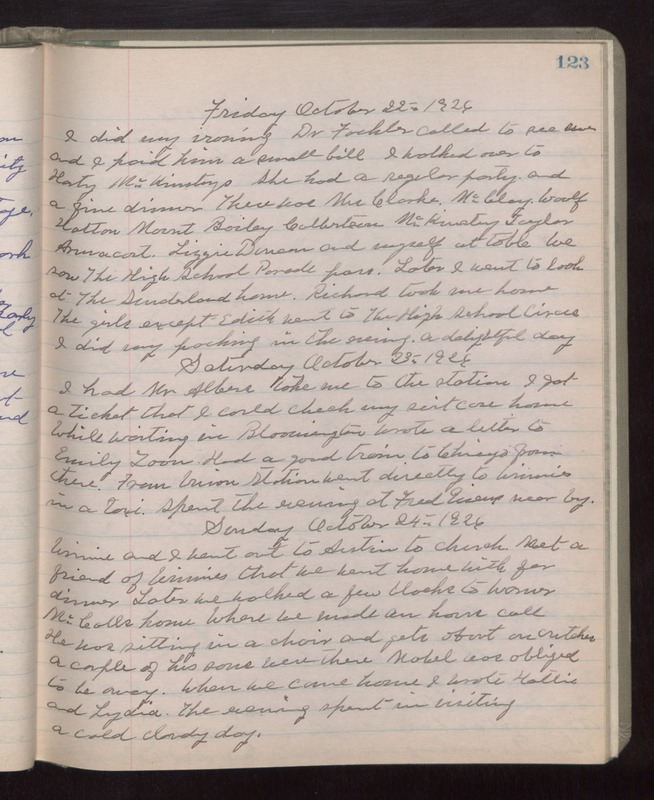 Sunday October 24th 1926 Winnie and I went out to Austin to church. Met a friend of Winnies that we went home with for dinner. Later we walked a few blocks to Warner McCalls home where we made a house call. He was sitting in a chair and gets about on crutches. A couple of his sons were there. Mable was obliged to be away. When we came home I wrote Hattie and Lydia. The evening spent in visiting. A cold cloudy day.